Aaron Overhead Door is a family owned company providing Cupertino CA garage door repair & replacement services. We also replace and repair garage door openers and remotes. Our motto is “where quality comes first,” because we never cut corners and every job is done promptly and professionally. 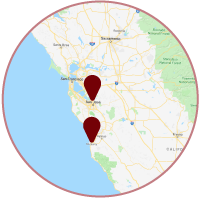 We service all of Cupertino, including City Center, Creston, Fairgrove, Faria, Garden Gate, Homestead Villa, Monta Vista, North Blaney, Oak Valley, Rancho Rincancda, Skyline, Vallco, Wilson Park, Woodspring and everywhere else. We are Cupertino’s garage door repair company of Choice! Read our reviews below to find out why your Cupertino CA neighbors call us first, whether they need a stunning new look or a fast garage door repair. Outstanding response, communication, service, & price. Freddie was honest and professional. Took time informing me about my garage door situation on what was really needed vs what I thought might've needed. I was initially looking at mAking reoIds to my existing door but Freddie told me it wasn't going to be worth it since I will likely have to replace the entire door in the near distant future anyway. Appreciate the honesty vs them Just out to make a quick buck. Replacing a new garage door opener. you can see the old, broken garage door opener at the bottom and the new garage door opener is at the top. The now opener is smooth, quiet and has the latest safety features.